Mark is just what the doctor ordered for nostalgic audiences who sorely miss protagonists who single-handedly send men crashing into trees and automobiles and are willing to be sacrificial lambs for communal good. Mark (debutant Sabarish) is a youngster with a sculpted body and an angry-young-man aura. Introduced flying through the air to save a baby's life, Mark is an amnesia patient who lives in the midst of a tribe in an inaccessible pocket of nature's bounty. The community makes its living by illegally felling bamboo shoots and supplying them to corrupt officials. It is led by a young woman named Shivangi, who justifies her position by slaving away even when the rest of the village makes merry. Mark can recollect nothing but snippets of knowledge from his previous as-yet-unknown life, that help him survive and save the lives and livelihoods of the tribe that has adopted him. He travels on a platform constructed from bamboo stalks, with a red flag fluttering high, and delivers emotional monologues (in a style that ran out of vogue half a decade ago) that suggest the movie's intent to focus on downtrodden communities. One thing leads to another, and Mark finds himself in a city. His past catches up with him, when a man called Vittal (Srihari) triggers off his memory. Post interval, the tribe, their troubles and a germinating seed of a love story are left exactly where they belong - in the first half. Mark, we learn, is one of the many kids adopted by Vittal, who are fed, clothed and educated so that they may carry out his low-brow work for him. Everything proceeds glitch-free till a woman called Divya (Nivedita) walks in with her endearing attitude, stunning body and heavily accented Telugu. Making up for the lack of skin show in the first half of the flick, Divya happily flaunts her slender, toned limbs and features. Soon, Mark's attention shifts from Vittal to Divya. A stale sketch of Divya's life is soon made, which involves the relationship among various leading characters. Vittal and his son (a sadist who derives pleasure from drugs and violent foreplay) cruelly cause the death of Divya, and thus each sign their own death warrants. This directorial debut of fight master Vijayan is as good as a half-baked brownie garnished with emerald moulds - a pretty picture from a distance, but inedible. The two halves of the film are like twins connected to each other only by the blood in their veins, and are psychologically and behaviorally polar opposites. While the first half is romantic in the literary sense of the word, and the other half is romantic as described by the filmi dictionary. Where the former is a unique interpretation of life, the latter is grossly repetitive, and the audience seems to be considered equivalent to cattle throwing up semi-digested food only to chew it all over again. Listing the shortcomings of this movie would result in a sheaf of papers as bulky as a film's screenplay. The songs are visually pleasing, but the lyrics are to be ignored. The costume designers and set designers are the pedestals on which the film has been supported. Sabarish and Nivedita both seem promising. 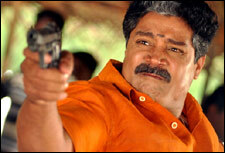 Srihari, with his chiseled body, is capable of giving actors half his age a run for their money. Having enlivened positive characters on celluloid for a better part of his career, it's hard to watch his character carry hues of negativity, and you keep guessing wrong at various junctures of the film. Do yourself a favor, and wait for Mark to hit the small screen. Be the first to comment on Mark! Just use the simple form below. fullhyd.com has 700,000+ monthly visits. Tell Hyderabad what you feel about Mark!